One may ask, what the heck is a leek? 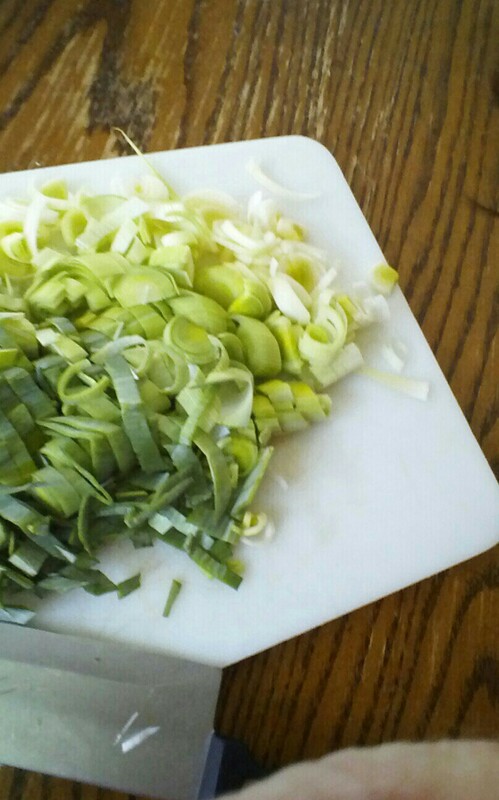 Leeks are a member of the onion family they look like overgrown scallions (green onion) but have different taste. They are mild and sweet. They lend themselves to well to tomato and potato. Leeks are very good for you (as are any members of the onion family). Low in calories yet high in flavor, the onion family is a great addition to many dishes. For those who do not care for onions because of the strong odor, leeks can be a good choice because of their mildness. 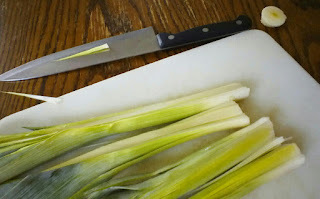 I think people shy away from leeks because of not knowing what they are or how to cook with them. They are just a fancy type of onion. If you really want to impress someone cook with leeks. It sound fancy enough to impress any guest. Leeks are notorious for lending a little grit to a dish if not cleaned properly. The layers are really tight and they tend to hold onto the sand that they are grown in. It requires a bit of attention, but the results are worth it. For me, I like to slice the root end off the leek and then slice it lengthwise right down the middle. Fan open the layers and then run them under cold water rinsing out much of the dirt. Slice the leeks thinly and then place them into a large bowl of cold water and swirl them about. Let them sit for a few minutes. Any lingering sand and dirt will sink to the bottom. Remove the leeks from the top of the bowl leaving any dirt or sand behind in the water. I was first introduced to leeks while in chef school. We made a classic French chilled potato and leek soup. I do not care for cold soups, but I love hot soups. A few years later I was introduced to Minnesota wild rice and leek soup at a place that I worked. It quickly turned into a favorite. It continues to be a favorite. It seems that whenever I make it people request the recipe. 1/4 cup half and half, or milk. Reduce heat to low, add flour, and stir well.Add broth gradually, whisking well with each addition to eliminate lumps in flour. Add wild rice and salt. continue simmer until rice is tender but still a bit chewy (about an hour). Stir in the half and half or the milk and garnish with parsley and chives if desired. Can be made with vegetable stock, and olive oil instead of butter for a vegetarian dish. sounds just delicious to me--thanks for the recipe! Sounds delicious! 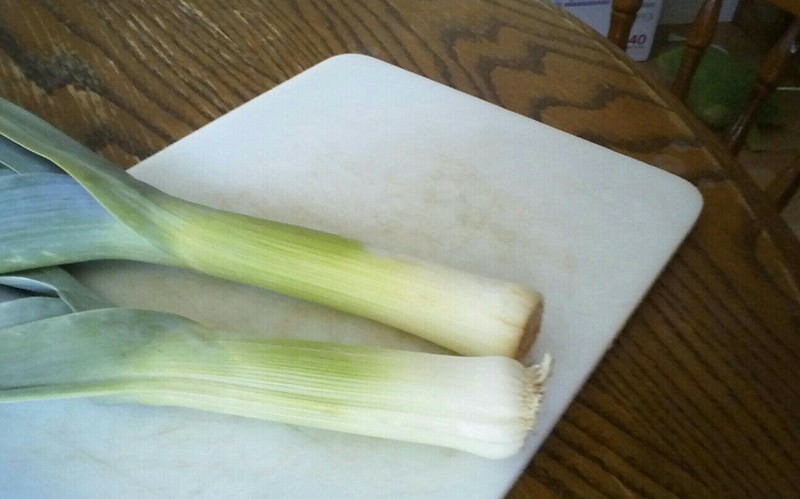 I have eaten leeks that others have prepared, butI haven't tried cooking them myself...maybe it is time. I love leeks and this soup looks delicious. Thank you so much for sharing with Full Plate Thursday and have a fabulous weekend. I LOVE leeks in soup. I'll have to try this one! We love leeks. I always debate growing our own. Thanks for sharing on Tuesday Greens! Great post! I am a leek lover :) I had never eaten them before I started my CSA but now I am hooked. i remember the first time we got leeks in a CSA. I asked the same question (with more expletives)... now that I know, they're a treat!! i get so stoked when they show up at the farmer's markets. love them!